Help! I need to recover only photos from my iCloud backup? How to recover only photos from an iCloud backup? How to restore only photos from an iCloud backup? Stop panic, the following texts will guide you how to regain only photos from an iCloud backup. Hi! My iPhone went dead today and I had to reinstall it from factory settings. I then restored it from iCloud and only just noticed that everything but my pics got restored. Checking iCloud I find my pics are still there, they simply didn't get restored together with the rest (contacts, safari, reminders, etc.) How to go about restoring now from iCloud the pics only? Many thanks for urgent help. There is always the initial panic when you wonder whether you will be able to recover deleted or disappeared data on device. 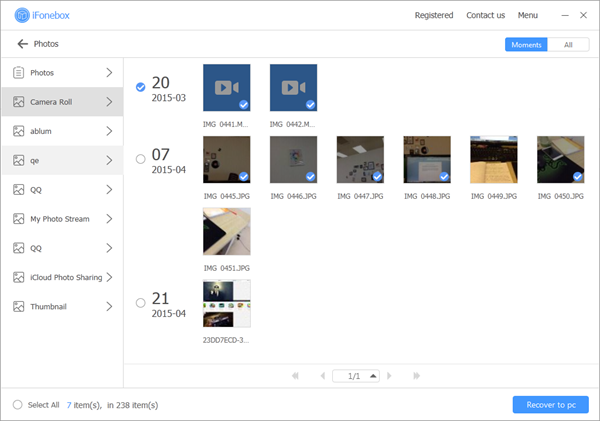 If you have lost your photos and have turned on iCloud Backup on your iPhone, then you have a great chance to get them back. However, if you’re going to recover only photos from an iCloud backup, I think you should turn to iFonebox for help. If you simply restore the iCloud backup you have, you may have to erase all contents and settings from the device before you can restore from a backup. Don’t worry, the problem can be eliminated with the help of iFonebox. This is because it allows you access the data on your iCloud, and restore only photos from backup (http://www.ifonebox.com/how-to-download-only-photos-and-videos-from-an-icloud-backup.html) by intelligent data extraction. the following are some of the features iFonebox has that make it an ideal choice. To begin download and install the program to your computer. 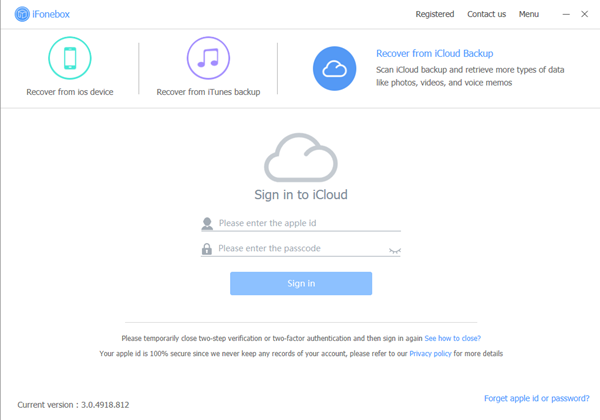 Once it is properly installed, follow these simple steps to regain only photos from an iCloud backup. Besides,iFonebox works exceptionally well on almost all iOS devices, there is no need to worry too much if your device is compatible with our program. However, it is considerably necessary to opt for the right version for your computer. Click on Photos item to start scanning automatically. You’ll be required to wait patiently whilethe circle is rotating continually and quickly. It’s time to get your photos from iCloud backup back, all you need is select the information you want and click the Recover to PC, then the task is accomplished.